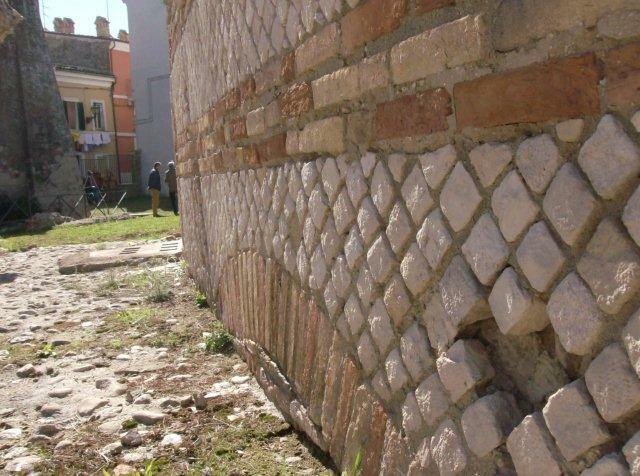 It is one of the most important archeological finds in Italy. It is the only example of Italic art that scholars can date back to around the sixth century BC. In some local dialects and in old expressions some people like to call him 'Lu Mammocce' which means <the big kid>. 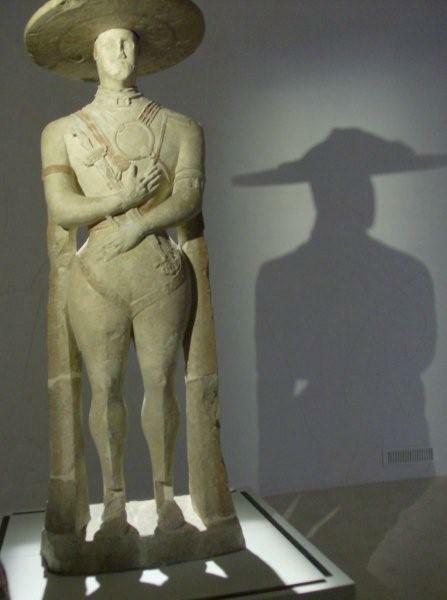 Actually it is a stone statue, which measures 253 centimetres tall. 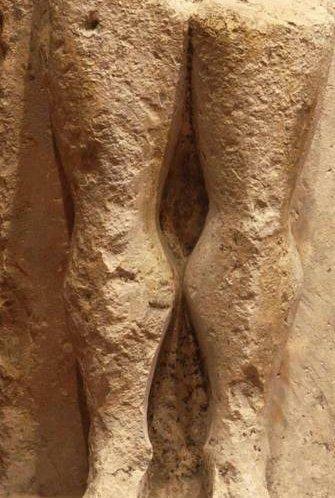 Two thin columns support the statue on either side; on the right hand column there is this inscription: MA KUPRI KORAM OPSUT ANI[NI]S RAKI NEVII POMP[UNE]I. It is believed that this inscription gives the name of the sculptor (ANINIS) or the name of an important person who was honoured after death. But there is a third interpretation far removed from scientific reason: the inscription can be related to the Golden Numeric Code, which, when combined with the proportions of the statue's hat, could be read 'MYSTERIES OF THE UNIVERSE' or 'THE SPEED OF LIGHT'. 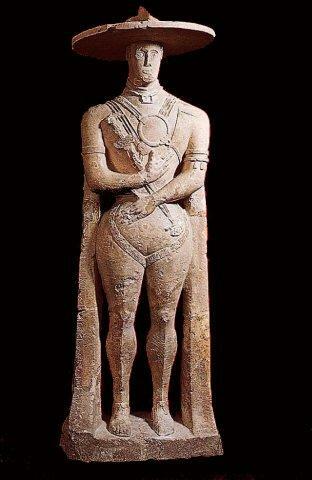 The proportions of the statue remind us of 'Gambe del diavolo' (the Devil's legs) from Colllelongo, near L'Aquila (in Abruzzo) and the torso of a statue from Rapino near Chieti (in Abruzzo). 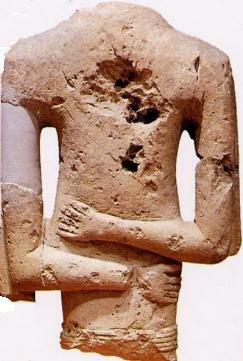 A less scientific interpretation of the physical form of the statue is that it is reminiscent of Pharaoh Akenaton. 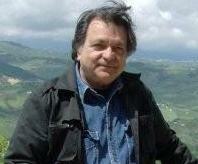 The Italian artist Mimmo Paladino in January 2011 created a new exhibition room on the ground floor of the Museum in Chieti for the statue. The art critic Gabriele Simongini explains: 'Mimmo Paladino has built an elliptical room, a wide space, continual and suspended, the proportions of which mirror the proportions of the Warrior's hat. The length of the room is 13 times the diametre of the hat and the width is 7,5 times'. These numbers, 13 and 7,5, are important for their symbolic value relating to the Golden Numeric Code. The walls are finished with a fine layer of ground stone from the region giving the room a special glow. In addition delicate designs similar to cave drawings can be seen when you get close to the walls. Museum Director Andrea Pessina describes the interpretation of the exhibition room by Mimmo Paladino: 'The thing I like is that Paladino has seen the Warrior with completely different eyes from those of an archeologist. For today's visitors, entering this room, their experience has the some emotional impact as it was for the people of the 6th century when they arrived at the necropolis in Capestrano'. 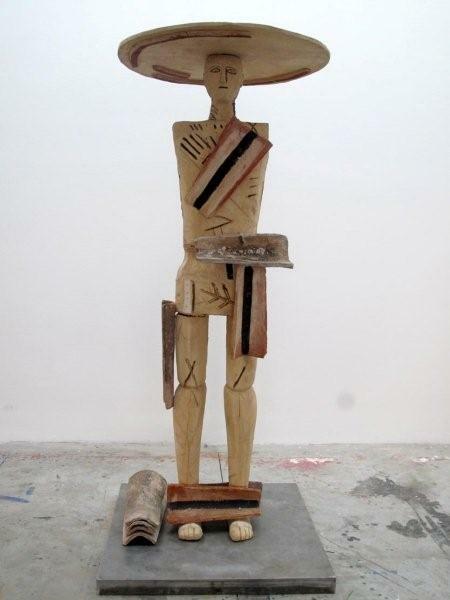 Whilst working on the new exhibition room for the Museum Mimmo Paladino was also creating a new interpretation of the statue: the contemporary Warrior made from terracotta is 2,56 meters tall and is based on the original Capestrano Warrior. However on his body there are designs similar to those that Mimmo Paladino painted on the walls of the elliptical room on the ground floor of the Museum in Chieti. 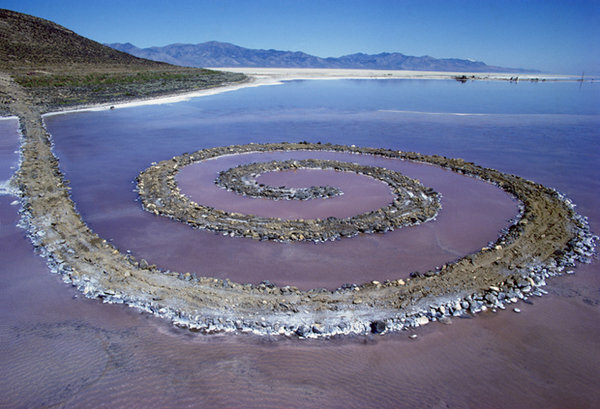 The two statues were photographed by Gianfranco Gorgoni, who also photographed in 19 71 the “Spiral Jetty” by Smithson, an art installation (Land Art) in the Great Salt Lake in Utah (America). Gianfranco Gorgoni is famous for his pictures of the Pop Art artists and their work before they became famous in the 1960's.